Click on your question from the list below. The answer will then pop out under the question. To close the answer, just click on another question. All of the paints we use are of the highest quality. 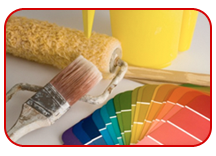 We use many different brands of paint depending on the particular needs of your painting project. We pride ourselves on keeping up to date with all the latest products and product changes. We use brands such as Kelly-Moore, ICI, Frazee and Behr. How long should the paint last? Is it guaranteed? Will the weather affect the painting? No, because we only paint on days that are suitable for painting. Your job is guaranteed, and we will not paint in conditions that will adversely affect your paint job. How soon can you start painting my home? Normally, our workweek runs from Monday through Friday. In the event that we are booked and it is necessary to get your home painted immediately, we can make special arrangements to suit your needs to begin immediately even if that means that we utilize the weekends. How long will the painting project take? This will depend on the extent of preparation and painting needed for your home and the size of the crew doing the painting. The crew size can vary between 2 to 7 men depending on the particulars of the painting project. The average crew size is 3 to 4 men; with a job foreman on location at all times. Most homes are done on average within two days with some homes being completed in one day. On occasion, a select few homes will exceed three days. Once we start painting your home, we will stay until it is complete. The only exceptions to this would be if the applied primer or sealer requires a longer drying time, or if we are delayed by weather. How many painters will be on my project? Typically there will be 2 painters, a foreman and a painter. On larger projects we will have 3-4 painters. What should we do before the painters arrive? If possible, please walk around your home prior to the painters’ arrival. Please remove any items that are against or near the house. This would include wood piles, potted plants, lawn furniture, tools, etc (if you need our assistance, we would be happy to help you). If you have animals and you are going to be home during the painting, no problem. They can be moved as we go along. If you cannot be home during the painting, please make arrangements beforehand to have them looked after. This will help the painting process be streamlined and make the animals more comfortable. All plants, trees and flowers will be covered to protect them from paint. Some branches may need to be trimmed to provide access and keep branches off the fresh paint. We prefer that you take this step prior to the painting process. If you would like us to do the pruning, please make sure this is clear with your salesman before the job starts, and that you point out any especially delicate plants. Not necessarily, but we do recommend it. We prefer that you watch our progress during the job so that all of your questions can be answered. We do require access to water and electricity. Doors will need to be opened during the painting and left open for 3 to 5 hours to dry. If you are unable to be home, you will need to make arrangements for water and electricity availability and to have the door remain open as necessary. How thorough is the clean-up? Clean-up is a very important aspect of our job. All materials used in the painting of your home will be removed. Paint scrapings and sanding dust will be swept from all surfaces and properly disposed of. Any spills are immediately and thoroughly removed. Our goal is to make your house look great, and to leave no trace but an immaculately painted house. Payment is due in full upon the completion of painting project. We will not bill you. Please make arrangements to pay the project manager when the job is complete. Larger jobs will be set up on a progressive payment schedule. If you have any problem with your paint job at all, at any time, please give us a call! We will take care of it! Remember, we want your house to look as good as possible, because your completed home is an example to future customers of our fine work! To make sure you have no complaints, inspect your job with the painters before they leave. We would much rather fix it immediately than later. Have a Question, Need a Free Quote? Click Here to get started.